You are here: Home 2012 December SCCM Configmgr 2012 Client Push Installation Tool ClientpushGenerator.exe. We have been using different Methods / Scripts to install SMS/SCCM Client from Previous version of Configuration Manager. This tool can be found from SCCM Installation Drive folder:\AdminConsole\bin\ClientpushGenerator.exe. This procedure requires you to enable Client push installation the site where the clients assigned to. Move onto Accounts Tab and create New Account. If you have custom command properties to be used for the client installation like port used,cache size,FSP,provide them on installation properties. How to provide local admin rights on target computers for the account specified here ? We are now done with requirements before we use Tool. This tool helps you to install SCCM Client based group wise , how you defined the Boundaries. If you boundaries are defined based on AD subnet/IP Address Range ,Get list of Computers from the specified Subnet/IP Address range and save them to Notepad. Create a notepad ,pipe the computers into it and save it. If you trying this on Already existing clients( could be CM07 as well),select always install the client. As soon you click on Push,Site server will create CCRs for each computer ,which you can see from CCR.box inbox folder. 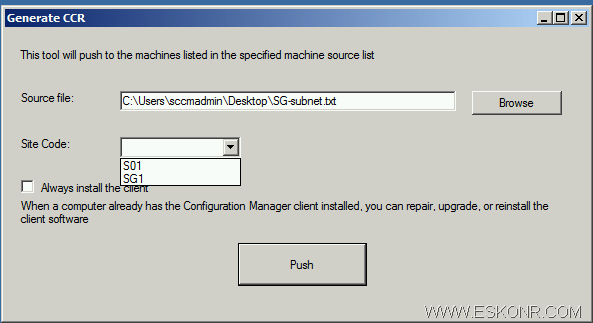 1.When you click on Push button, SCCM generates a client configuration request (CCR) file. The CCR file contains the client computer name and additional information. 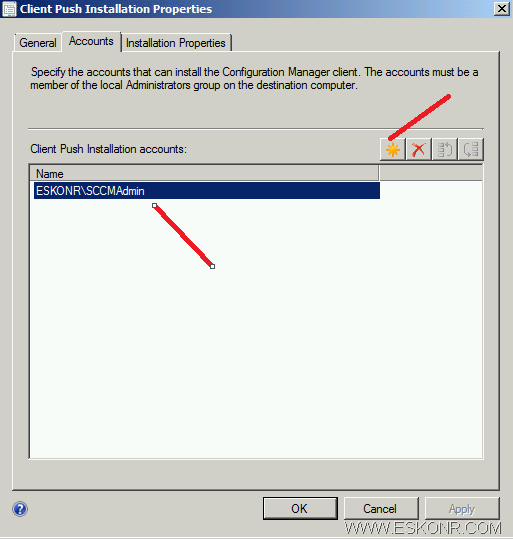 2.SCCM Client Configuration Manager connects to the ADMIN$ share on the client using the credentials what you supplied in client push installation Account. This is based on the information in the CCR file. 3. The Client Configuration Manager connects to the client registry and gathers information about the client. 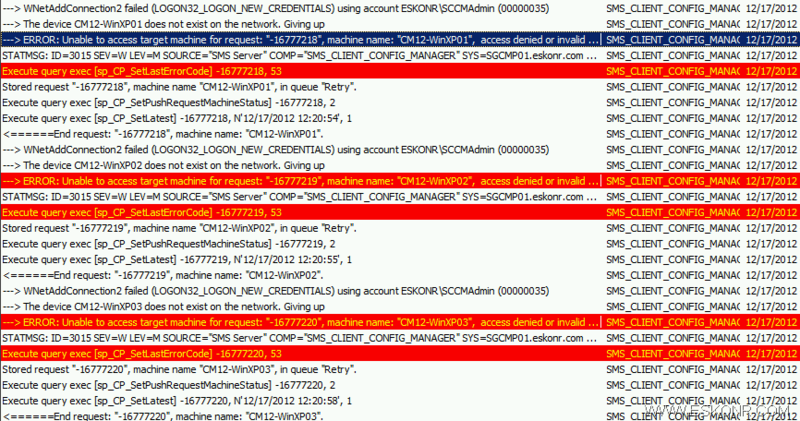 This process is displayed as a log entry in the Ccm.log as connecting to IPC$. 4. The SCCMcore component files, MobileClient.tcf and Ccmsetup.exe, are located in the SMS\bin\I386\ folder. These files are downloaded to the %windir%\ccmsetup folder on the client computer. 5. The Client Configuration Manager verifies that the Ccmsetup service started successfully before disconnecting. The CCR file is added to the SCCM\Inboxes\Ccrretry.box folder for verification that the installation succeeded. On a second verification pass, SCCM determines that the SMS Agent Host is running, and then deletes the CCR file. In my case,it is only 3 computers and process will be quick. For the Computers which are online and connect to admin$,Client will be installed successfully. 2 – The system cannot find the file specified. 52 – You were not connected because a duplicate name exists on the network. Make sure there is not a duplicate name in DNS and that 2 machines don’t have the same IP in DNS. 53 – Unable to locate – http://support.microsoft.com/kb/920852 – cannot connect to admin$ – Computer Browser not started – add File/print sharing to Exceptions in Firewall – turn file and print on. 67 – network name cannot be found. 86 – network password is not correct? Machine Name <> resolved name. 120-- Mobile client on the target machine has the same version, and 'forced' flag is not turned on. Not processing this CCR ,target machine already have cm client and no force install selected(always install). 1003 – Cannot complete this function. 1053 – The service did not respond to the start or control request in a timely fashion. 1203 – The network path was either typed incorrectly, does not exist, or the network provider is not currently available. Please try retyping the path or contact your network administrator. 1305 - The revision level is unknown. 1789 - The trust relationship between this workstation and the primary domain failed. You can also try reporting to see how many computers having issues with the client installation. 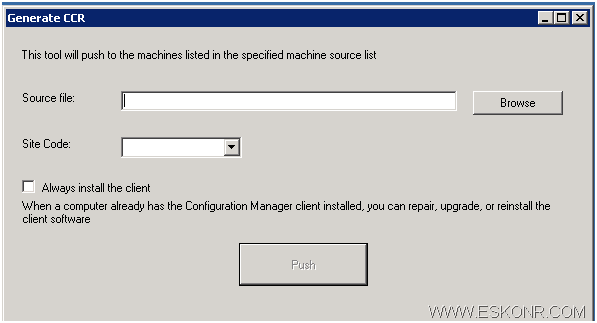 7 Responses to "SCCM Configmgr 2012 Client Push Installation Tool ClientpushGenerator.exe." Are there any command line options for this tool rather than using the GUI? Or do you know any examples of how I might script this functionality myself? sorry Jeff, i havent tried that way ,when i required to do,i always do it using GUI ,simple to use the GUI but ,there are other methods to install client to be more effective like Logon script(Jason Sandys script),OSD etc. Hi Eswar, i have one question here regarding clientpushgenerator -> Can we provide any shared location for accessing the source file? And how much bandwidth would be required to push a single computer or 100 computers at a time? In general how much bandwidth is consumed when we deploy sccm 2012 client agent by enabling Client Push Installation method? Can you please help me with this asap? using client push,you cannot provide the source location for the clients to download the content from and the possibility is (AFAIK), client can download the content from the available sites.If you use the script,you have the option to provide the source location in the ccmsetup.exe properties. "Client push installation starts and tracks the installation of the client by using the Configuration Manager database and no longer creates individual .CCR files. When you enable client push installation for a site, all discovered resources that are assigned to the site and that do not have a client installed are immediately added to the database, and client installation begins." It says that the individual .CCR files are not created and I tested the Generate CCR tool but couldn't see the .CCR files in the inbox too. yes,its True.In CM12,it will not create .CCR files based on the requestID only and these CCR files do not contain any information in it where as in CM07..CCR file has computer info . All these information is now tracked in database,for which you can create reports to see what status of client push installation.